The open pollinated dent corn varieties known as gourdseed corn have a colorful history in North America. As can be seen from the two varieties pictured here, the flat creamy white kernels bear some resemblance to gourd or pumpkin seeds. Hence the name “gourdseed”. According to Willie Woys Weaver writing in Mother Earth News (October/November 2008) the Iroquois and other Native Americans called it “tooth corn” for the resemblance to teeth. Whatever it was called, gourdseed corn became popular in the South in the 19th century, with the rural poor people favoring the yellow types and the more urban and wealthier people preferring the white seeded varieties (Weaver 2008). Gourdseed corn was also a staple of provisions supplied to slaves in the South in the early 19th century, according to American Slavery As It Is: Testimony of a Thousand Witnesses by William Weld (1839). According to Weaver (2008) gourdseed corns were used widely in the Ohio River Valley for feeding turkeys in the late 19th century. 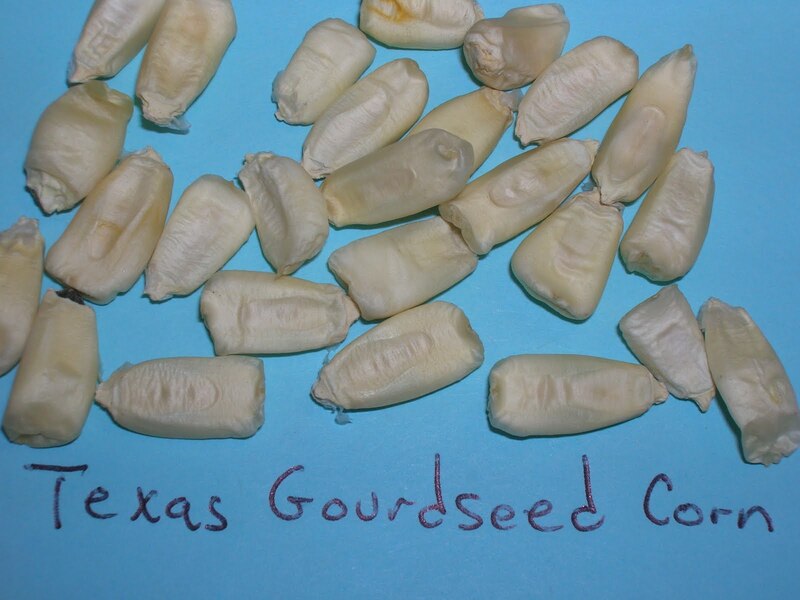 One particul ar variety developed in the Ohio River Valley and later taken to Texas by German settlers was known as Texas Gourdseed Corn. 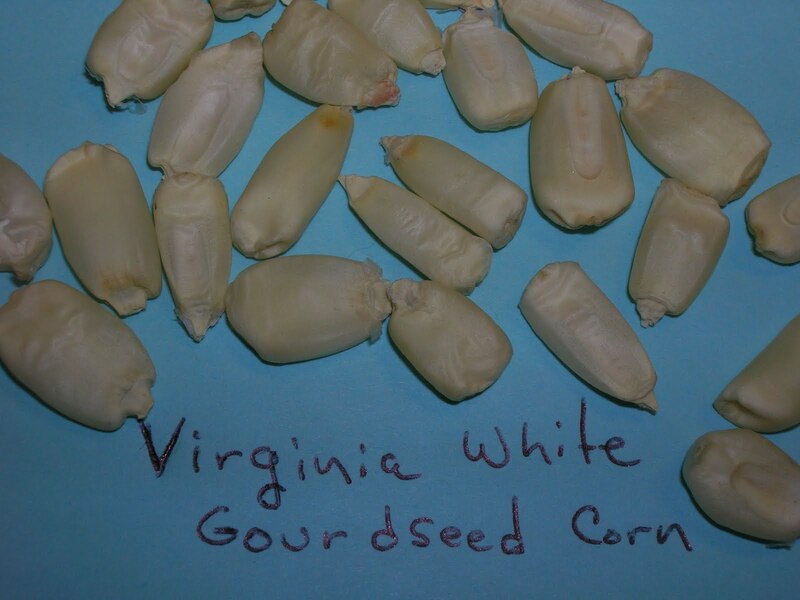 This variety has recently been reintroduced by the Southern Exposure Seed Exchange along with another variety, Virginia White Gourdseed corn. Glenn Roberts, founder of Anson Mills in South Carolina has reintroduced a third variety, Carolina Gourdseed White (reportedly found in a bootlegger’s field). Roberts also discovered that freezing the corn prior to milling results in a superior milled product including corn meal for white cornbread. In addition to corn bread other products which can be made from gourdseed corns include dumplings, puddings and poundcake (finely ground and well sifted). Cornbread made from gourdseed corn has a silky texture which cannot be duplicated using modern hybrid corn (Weaver, 2008). According to the Southern Exposure Seed Exchange 2010 catalog, gourdseed corn is also suitable for roasting ears. “Roasting ears” are similar to conventional methods of cooking sweet corn except that immature ears of field corn are harvested and “roasted” in the coals of fire or over a grill. Later “roasting ears” simply came to mean cooking field corn in the same way as sweet corn. In my home community in south central Pennsylvania, “roasting ears” was synonymous with boiled corn ears, whether sweet corn or immature field corn. One interesting fact in light of the earlier discussion regarding hybrid seed corn production using male sterile cytoplasm is that the gourdseed corns are a source of resistance to southern corn leaf blight, the disease that caused all of the grief for hybrid varieties in the early 1970s.